“Climate change was not a priority before TraCS…” said the head of the Roads Services Unit in the Ministry of Transport during the two and a half day “Data Requirements & Emissions Calculations for Decarbonising Transport” training held from October 11th to 13th 2017. He acknowledged the contribution the project has played in shifting the narrative and was looking forward to the sector playing a leading role in the next phase of implementation of the National Climate Change Action Plan (NCCAP). 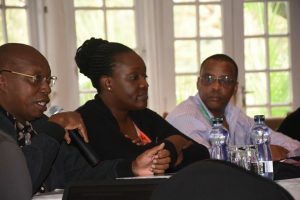 The training, which included representation from all key agencies within the ministry of transport, focused on two major issues: 1) introducing participants to the main approaches of emission calculation and mitigation option analysis for the transport sector, and 2) exploring the next immediate steps for the project. In the end it was agreed that TraCS, through the State Department of Transport and GIZ, will support revision of the National Climate Change Action Plan transport sections and will offer all necessary assistance including reviewing the mitigation potentials and further capacity enhancement for the engaged institutions. These revisions will be based on the agreed upon workplan provided by the Ministry of Environment and in close coordination with the overall revision process, also supported by the NDC Partnership.